The Sload (sometimes called worms or slug-folk) are a race of sluglike beastfolk living in the Coral Kingdoms of Thras, southwest of Tamriel. Sload are innately cautious and careful. In their mythic traditions, all heroes spend years planning, considering and consulting with wise Sload before taking the correct action and achieving their goal. By contrast, their villains all act quickly or rashly and always fail. The Sload language has no word for 'adventure', and the closest equivalent more accurately means 'tragic disaster'. Sload apparently do not experience emotions as the Tamrielic races do, but are often skilled at acting and may exaggeratedly simulate them for the benefit of more emotive beings. They will honor laws, loyalties, and friendships only as long as they calculate it to be in their best interests to do so. They also have no compunctions against blasphemy, theft, kidnapping, murder, genocide or anything else that may help them reach their goals. 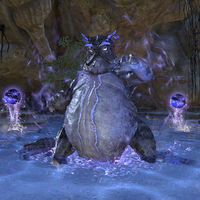 Sload are apparently not religious and generally reject worship, but will willingly serve Daedra if they benefit from it. Some, in particular the famed Second Era necromancer N'Gasta, also follow the King of Worms. There are some rumors that Sload have airships carrying corpses from Senchal to Thras. It is unknown exactly how Sload reproduce. They are believed to be hermaphrodites in their youths, though the sexual organs seem to be absorbed by the time they are old enough to survive on land. Sload parents care little for the fate of the young, and will often kill them to make Sload Soap, which they use in necromantic rituals. Sload begin their lives as "disgusting little amorphous grubs" according to Bendu Olo, leader of the punitive expedition sent by Tamrielic nations to Thras after the Thrassian Plague. The young Sload mutate into aquatic quasi-cephalopods called "polwygles" before they reach adulthood. Due to the corpulence of the adult Sload's slug-like humanoid body, they spend much of their time wallowing in shallow lagoons and move very slowly. Sload supposedly have a poor grasping ability, making it difficult for them to use tools. The integument of Sload can slowly adapt to objects and surfaces, which allows them to climb surfaces like slugs. Sload are highly intelligent and skilled at magic. Their mastery of the art of necromancy is renowned. The Sload Coral Kingdoms have generally followed an isolationist policy, much due to being at war with the rest of Nirn, but they have had diplomatic relations with the Maormer of Pyandonea. Therefore their history is not greatly known. The most important event known is when they released the Thrassian Plague upon Tamriel in 1E 2260, killing more than half of the population. In response, Tamriel assembled the All Flags Navy at Stirk that ravaged Thras, killing all the Sload it could find and finally sinking it with unknown magics. The Sload, however, survived, and Thras has since risen again. In addition to Thras, Sload also rule other realms in the Sea of Pearls. One such realm is the undersea kingdom of Ul'vor Kus, which is home to the Sea Sload, who are known to be even more reclusive than their Thrassian cousins. 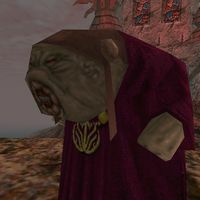 In addition to necromancy, the Sea Sload are also skilled in the arts of alchemy, shadow magic, and mind magic, as well as other arcane disciplines. The Sea Sload often tend to form cabals amongst themselves to achieve common goals, which then break up or reform as those goals change. Sea Sload utilize various deep sea creatures, such as the yaghra, as servants and soldiers. In the mid-Second Era, the Sea Sload were thought to be near extinction by the Sapiarchs of the Crystal Tower. However, several sightings of Sea Sload on Summerset Isle were made circa 2E 583, dispelling this belief. "Sload" is a portmanteau of "slug" and "toad".